If you do not want to collect payments online and want to process payments manually / offline / Cash On Delivery, you can do that also in your Pixpa Store. Your customers will be able to place their order on your store without making online payment. You would need to process payments offline (Bank Transfer / Cash on Delivery etc). This can be used in several cases, for example, if you just want customers to book a service or Cash On Delivery product, which they will pay for later. 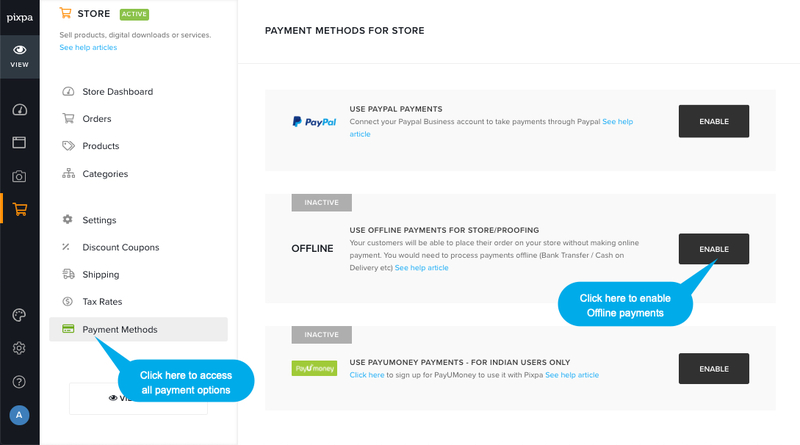 You would see all the payment option that you can connect with your Pixpa store. Click on Enable button next to Offline payment option. In the next step, You would see the Active link on your Offline payment option as shown below. You can disable the offline payment you have just created by clicking on disable button.